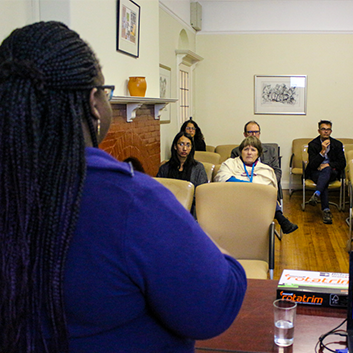 Dr. Lily Kpobi, a clinical psychologist from Ghana currently studying for her PhD at Stellenbosch University, presented her recent research at our September seminar. 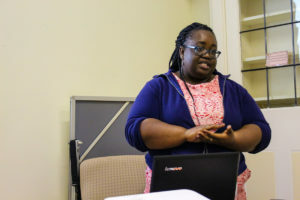 Generally, her research focuses on understanding mental health issues and strengthening mental health care systems within cultural contexts and she presented her work on explanatory models of mental disorders among indigenous and faith healers in Accra, Ghana. For her PhD, Dr. Kpobi interviewed a variety of faith healers in Accra to investigate how they understand and identify mental disorders present in patients. She also investigated the possibility of collaboration between these faith healers and the biomedical community. In many African countries, indigenous and faith healing form an integral part of the health care system, including for mental health care. These non-biomedical mental health care systems typically evolve within specific cultural contexts, and thus beliefs about the nature and causes of mental disorders tends to inform the treatments and practices of the healers. Using an Explanatory Models of Illness framework, she examined the notions of different categories of indigenous and faith healers about different biomedically-classified disorders. Through case vignettes, she interviewed 36 participants to explore their beliefs about the nature, causes, implications and treatments of a serious mental disorder (schizophrenia), a common mental disorder (depression), and a disorder driven by social circumstances (PTSD). The data suggest that while there was consensus among the different categories of healers about what constituted a serious mental disorder, differences existed between the different healers about classifying milder conditions as mental disorders. Treatment methods also varied based on the orientation of the healers. These explanatory models are discussed with emphasis on their implications for collaboration and for biomedical practice. You can access her facinating presentation below and also listen to the recording of the seminar. Together with her study leader, Prof Leslie Swartz, she also published a piece on The Conversation about this research. You can read it here.